The Michigan Modern exhibit and symposium, both in Grand Rapids this month, are guaranteed to draw modern design enthusiasts to the Grand Rapids Art Museum and Kendall College of Art and Design. 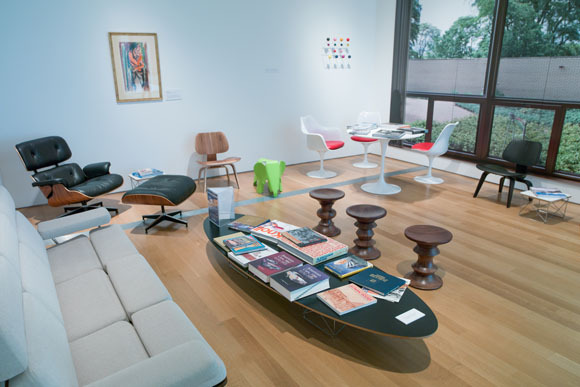 Writer Bona Van Dis finds out how all these Eames lounges and Noguchi tables represent the way modern design and creative collaboration are embedded in West Michigan. Most of us by now recognize the iconic Eames Lounge and the Noguchi table and know the names George Nelson, Herman Miller and Steelcase. And we understand these names are synonymous with innovative design. But we often forget about their roots, and how these forward-thinking businesses, avant-garde ideas and modern designs were cultivated and grown right here in West Michigan. Our region has been a hotbed, a catalyst and leader in modern design since the turn of the twentieth century, and Michigan Modern: Design that Shaped America is here to remind us just how vast and deeply embedded it is in our landscape. Michigan Modern comes to Grand Rapids after its debut at Cranbrook Art Museum in Bloomfield Hills, Michigan last summer. Michigan Modern is an ongoing project that began in 2008 when the Michigan State Historic Preservation Office received a Preserve America grant from the National Park Service. The goals of the project are to define Michigan’s role in the development of American modernism, rebrand Michigan based on its outstanding design heritage, develop modern-based tourism, raise awareness, encourage preservation and use our current design industry to attract new talent to the state. 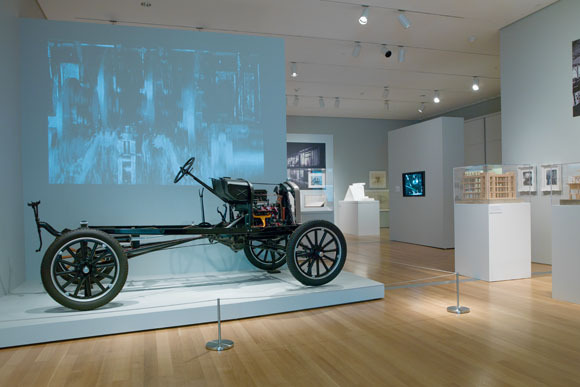 The Michigan Modern exhibit, currently running at the Grand Rapids Art Museum (GRAM) through August 24, and the symposium at Kendall College of Art and Design (KCAD), gives a nod to our side of the state’s historical impact on modern design. Both are guaranteed to draw modern enthusiasts, as well as newcomers to modern architecture and design. Dana Friis-Hansen, director and CEO of GRAM, is thrilled to showcase Michigan’s modern masters, and is quick to note why. The symposium, to be held at KCAD June 19-21, will offer a whirlwind weekend of lectures and optional tours. 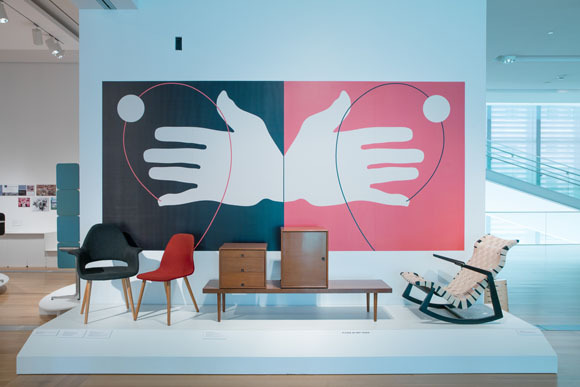 World-renowned designer Todd Oldham will kick things off with a keynote lecture on Alexander Girard, whose textiles for Herman Miller were often paired with furniture designs from Charles and Ray Eames and George Nelson. Among many nationally recognized speakers, the symposium will feature lectures from Mira Nakashima, daughter of celebrated furniture designer, George Nakashima; Marilyn Moss, discussing fabric artist, Bill Moss, creator of the modern pop-up tent; Donald Albrecht, curator of architecture and design at the Museum of the City of New York; and playground equipment designer and sculptor Jim Miller-Melberg. Attendees can also sign up to tour modern residences in East Grand Rapids, the Meyer May House, Herman Miller Furniture Company’s design and manufacturing facilities, and St. Francis de Sales, a Muskegon church designed by Marcel Breuer. John Berry, host of the Michigan Modern symposium at KCAD and founder and executive director of Design West Michigan, knows just how valuable this exhibit and symposium are to Grand Rapids. “Michigan Modern recognizes the deep heritage that exists in this part of the country, and the really good work that continues,” he says. Berry asserts that our region has definite bragging rights in shaping the history of modern design, but he also sees the great things coming out of West Michigan right now. While we may not be very vocal about our successes, both Grand Rapids and West Michigan are being noticed for their design know-how. “A very collaborative, supportive mindset exists here…and we’re seeing people from all over the country applying for design-based jobs here in West Michigan,” Berry adds. Berry, whose leadership has rallied over 1000 members to Design West Michigan, sees Grand Rapids as a cooperative community, and he believes “a web of talent and connectivity between different disciplines to work on a common problem” will help us continue building on our modern roots. Berry also notes that our region produces more industrial designers than any other state in the country. One of those designers, Joey Ruiter, has drawn international recognition and even had his own exhibit at GRAM—a true testament that design is being recognized for its impact on our lives. 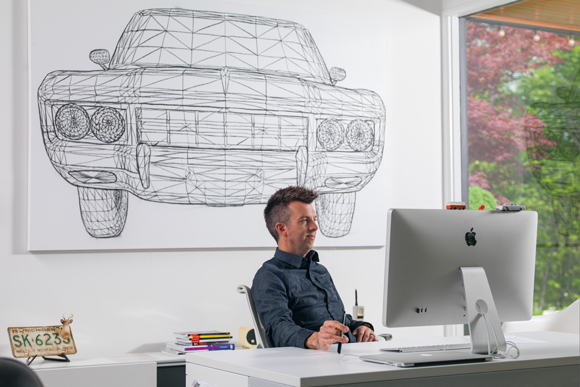 Joey RuiterA Kendall grad, Ruiter designs (and builds) miraculous things— bicycles, motorcycles, concept cars—and has designed furniture for all the leading names. He sold his first chair patent to Steelcase before graduating. Having worked with these leaders and being a leader himself, Ruiter knows West Michigan has a prolific, pioneering design history. “As a city, we’re built on craftsman and business leaders who were willing to move forward, willing to try something new. We have that spirit of ‘nothing’s impossible.’ There might not be data to support a project, but we’re going to do it anyway,” Ruiter says. Friis-Hansen stands on the same front, and GRAM recently expanded its focus to art, design and creativity, moving key works of design history into its collection galleries to highlight the visual power of everyday objects. “The region is increasingly recognized for collaboration, cross-pollination and entrepreneurship…and I’m thrilled that the museum can provide diverse platforms for experiences like this exhibition and the dialogues it sparks,” Friis-Hansen says. With our rich modern design history, people like Ruiter, Berry and Friis-Hansen at the helm, and hosting exhibits and symposiums like Michigan Modern…West Michigan? It’s time to start bragging. 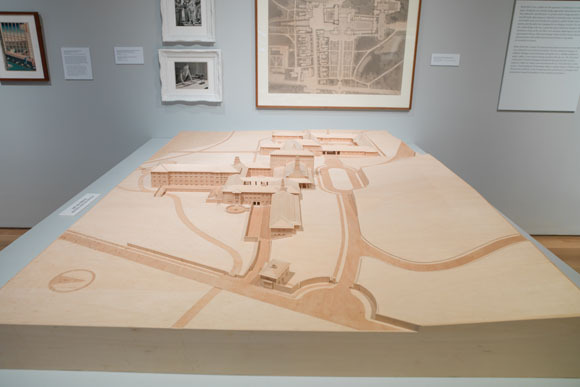 A complete list of symposium events can be found at michiganmodern.org. For exhibit information, visit GRAM’s website: artmuseumgr.org. Bona Van Dis is a freelance writer and editor. She lives in East Grand Rapids with her husband and two sons.